Instructions for making doll hair by crocheting a cap and brushing out the yarn using Wild Brushable Mohair yarns. Wild Brushable Mohair yarn is intended to be crocheted into a cap, then the fine mohair fibers brushed out to create the hair style. Please refer to the How to Crochet a Cap Instructions for cap directions. You must use the Wild Brushable Mohair Yarn for this technique. Crochet hooks to crochet yarn into a cap for dolls. Please see our free online crocheted cap instructions under the yarn section. Aluminum for long lasting use. 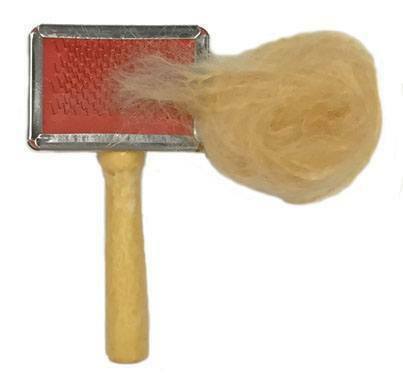 A carding blender that works well for brushing out Wild Brushable Mohair cap hair styles. An inexpensive version of a larger carders, working surface is about 1 x 2 inches, great for working on doll heads. Single brush. Short pieces of wild brushable mohair yarn colors on a card for color matching.